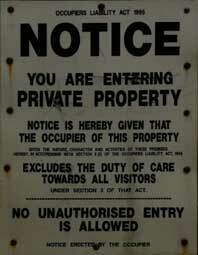 Killbrittain castle (which is barred by the ominous notice below!) is the oldest inhabited castle in Ireland. 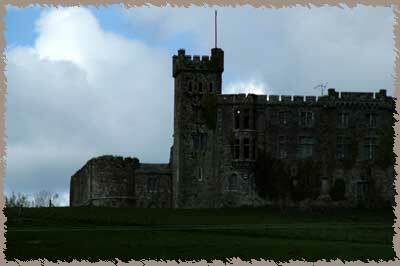 The earliest parts of the castle date from 1035, and was built by the Mahoney clan. It passed to the de Courcy's in the 13th century (perhaps as early as 1295), and was enlarged and extended at that time. The two families dsputed ownership of the castle, and it changed hands several times, until the de Courcys lost the castle in 1449, although they regained it later. By the 15th century, it was in the hands of the Macarthys. It rmeained the principal seat of the Macarthy family until it was surrendered in 1642. The more moden parts of the castle date from the 18th and 19th century and the work was done by the Stawell family. The castle was burned in 1920, but the east end of the ruin was restored as a residence. It contained little of the original building, except a spiral staircase and a few of the original gunloops. Many stones from the old castle show up in later houses in the area.